The Métis are one of Saskatchewan’s founding people and have contributed to Saskatchewan’s social, cultural, economic and political fabric. Métis settlement in what is now Saskatchewan predated the development of an agrarian society by over 100 years. In the later 18th and early 19th centuries, the Métis plied their various skills in the fur trade. After 1821 and the consolidation of the Canadian fur trade, and until the age of the railway, Métis traders criss-crossed what is now Saskatchewan in vast caravans of Red River carts. The Métis also helped missionaries bring Christianity to the prairie west and the region’s First Nations. They were also bison hunters and plainsmen par excellence. Métis women became renowned for their skill in beadwork and embroidery, particularly through the flower beadwork motif. During the 1870s, with the consolidation of the prairie west into the new Dominion of Canada, the Métis patrolled the Canada-USA border to prevent a Fenian invasion; they also helped survey the region and paved the way for agrarian settlement, serving as guides and scouts; and during the Numbered Treaty (Treaties 1–7) process, they acted as interpreters. In the settlement period (1896–1929), many Saskatchewan Métis persisted as squatters on Crown land and were known as “Road Allowance People.” In the early years of agrarian settlement, Métis women delivered many of the pioneers’ babies, while others tended the sick through the use of traditional medicines and remedies. Despite being a marginalized and dispersed population, Saskatchewan’s Métis served in the Boer War (1899–1902), World War I (1914–18), World War II (1939–45), and in the Korean War (1950–53) in proportions much larger than the general population. They also began to move to the cities after World War II, contributing to the province’s gradual urbanization; some were forced onto Métis farms by the CCF government in the late 1940s and early 1950s. During the modern era, Saskatchewan’s Métis laboured to build strong self-determining communities through education and training. This is the documented history of Saskatchewan’s Métis; their past can also be elucidated through both oral history and the archaeological record. In the oral tradition, as told by Elders, the Métis were a proud and independent people who “owned themselves,” hunted bison, spoke their own Michif language, were stewards of the land, danced and jigged to spirited fiddle rhythms, told stories, had reverence for the elderly and the young, and were deeply religious. The archaeological record also provides insights to the Métis’ past inhabitation of what is now Saskatchewan: fur-trade post sites such as Cumberland House, Métis wintering or hivernant sites such as Petite Ville (an hour northeast of Saskatoon) or Chimney Coulee in the Cypress Hills, or remnants of Métis Road Allowance communities such as those at Crescent Lake (near Yorkton) or Katepwa (near Lebret) provide glimpses of how previous generations of Métis interacted with their environment, what they ate, and how their material culture progressed. The spatial distribution of Saskatchewan’s Métis is diverse. They live throughout the province, particularly in four urban centres: Regina, Saskatoon, Prince Albert, and North Battleford; recent statistics indicate that the Métis are overwhelmingly an urban population. However, they also live in the following towns and villages: Beauval, Buffalo Narrows, Cole Bay, Green Lake, Ile-à-la-Crosse, Jan’s Bay and Turnor Lake in the northwest; Cumberland House and La Ronge in the northeast; Archerwill, Batoche, Big River, Cochin, Debden, Duck Lake, Leoville, Meadow Lake, Nipawin, Pine House, St. Louis, Spiritwood and Yorkton in the centre-parkland; and in the southern plains, Lebret, Lestock, Fort Qu’Appelle and St. Victor-Willow Bunch. The Métis have also lived in the province’s urban centres since the fur trade. In fact, the two oldest continuously inhabited communities in Saskatchewan—Cumberland House (1774) and Ile-à-la-Crosse (1778)—are Métis communities. In addition it was a Métis, James Isbister, who founded Prince Albert, the province’s third largest centre, in 1866. There has not been, despite attempts in the late 1990s, a thorough enumeration of Saskatchewan’s Métis. The 2001 Statistics Canada Census indicates that there are approximately 40,000 Métis in Saskatchewan, but the Métis Nation–Saskatchewan (MN–S) maintains that their number is closer to 80,000. An accurate enumeration for the province’s Métis community is vital, however, as both the federal and provincial governments provide program funding based on population to the MN–S and its affiliates. Between the 1991 and 2001 census, there was a significant increase in the province’s Métis population, owing to both a high birthrate and a large increase in the number of people self-identifying as Métis–as a result of increased awareness of Métis issues and of the perception that holding Métis status bestows specific benefits not available to the non-Indigenous population. Families, both nuclear and extended, are the main structure of Métis society. Métis family genealogies are traced through patrilineal descent. However, both matrilineal and patrilineal kinship ties have been important, especially since family clans were usually composed of sisters and their families, who often lived in close proximity. Even today, it is not uncommon in Métis families for maternal cousins who are raised together to consider themselves brothers or sisters. Saskatchewan’s Métis are a mixture of Red River fur-trade and bison-hunting families who emigrated to the region from Manitoba after the Red River Resistance (1869–70), of fur-trade families that emerged in what is now Saskatchewan, and of First Nations, European and Euro-Canadian intermarriage into these Métis families. The ancestry of Saskatchewan’s Métis is primarily Cree, Saulteaux, French Canadian and Scots-Orcadian; however, many Métis have English, Dene, Dakota, Iroquois, Lakota, Nakota and Dakota roots. Most traditional Métis family names are either of French-Canadian or Celtic-Orcadian origin; however, many Métis now have First Nations, Ukrainian, Scandinavian or German surnames. While the term “métis” means mixed, the Métis see themselves as a distinct Indigenous people, one of three constitutionally recognized Aboriginal peoples in Canada under the Constitution Act, 1982, s.35.2, and not merely as an amalgam of different parts. The social, cultural and economic dynamics facing the Métis vary and are dependent on locale. This socio-economic landscape ranges from remote northern communities, which focus on traditional lifestyles, to timber-producing, ranching and farming communities, and finally to urban centres. Despite such variation within the province’s Métis community, there are some consistent socio-economic trends. For instance, the Métis have a younger population, lower levels of educational attainment, higher levels of poverty, poorer health, and often suffer from a greater number of pathologies and face greater social displacement than the non-Indigenous population. Therefore, the sociological landscape of Saskatchewan’s Métis is markedly different from that of the non-Indigenous population. Despite such discrepancies, Métis agencies have been working to address these problems, and since the 1980s have made great inroads towards ameliorating the social conditions. For instance, largely through Métis educational and training programs, a developing Métis middle class consisting of educators, administrators, entrepreneurs, government workers and skilled trades people has emerged and is primarily concentrated in the province’s three largest centres. The Métis’ contribution to Saskatchewan’s cultural life has been profound. Some of the more prominent Métis cultural events in Saskatchewan include Back to Batoche Days, the Prince Albert Métis Fall Festival, Lebret Métis Days, the John Arcand Fiddle Fest, and Palmbere Days (Palmbere Lake). Some of the Saskatchewan Métis cultural ambassadors include Janice Acoose (author), John Arcand (fiddle player), Rita Bouvier (poet), Bob Boyer (artist), Maria Campbell (author/playwright), Warren Cariou (author), Don Freed (singer/songwriter), and Andrea Menard (actor/ singer). Traditional storytellers such as MN-S Senator Gilbert Pelletier and medicine person/ activist Rose Richardson are also ensuring that traditional Métis stories are being preserved. There are significant cultural areas within the province’s Métis community. In the province’s north, for instance, the cultural orientation of the Métis closely mirrors that of the local First Nations: Dene in the northwest, and Cree in the northeast. In central and southern Saskatchewan, the cultural makeup of the Métis is largely different from those living in the north in that they do not generally engage in traditional lifestyles and are less likely to speak an Indigenous language. 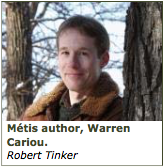 There are also linguistic variations among the province’s Métis. In the northwest, a form of Michif with a significantly higher Cree content than the southern variety is spoken in Ile-à-la-Crosse, Beauval, Buffalo Narrows and Pinehouse. In Cumberland House, Swampy Cree is the first language of many Métis. In the centre-parkland (Cochin, North Battleford, Meadow Lake, Debden, Big River, Prince Albert, Archerwill, and Yorkton) and along the southern plains (Lebret, Fort Qu’Appelle, and Willow Bunch), Michif-Cree, which is a mixture of French nouns and Cree verbs, was the first language of many Métis prior to the 1950s and the advent of urbanization. Finally, in Batoche, Bellevue, Duck Lake and St. Louis, Michif-French, a dialect of Canadian French, was traditionally spoken. Métis community groups and institutions such as the Gabriel Dumont Institute are working to revitalize Métis languages. The Métis have traditionally been a deeply religious people, with their own patron saint, St. Joseph. Religious adherence among contemporary Métis is difficult to discern; however, they generally practice Christianity, traditional Indigenous spirituality, or a mixture of these two systems. Pilgrimages such as those to St. Laurent, near Duck Lake, continue to attract many Métis, particularly the elderly. Marian devotion is particularly strong in Ile-à-la-Crosse. Many Métis also exclusively practice Indigenous spirituality through the burning of sweetgrass/sage, attending cleansing sweats, and giving thanks through the offering of tobacco. The Métis have always had a tradition of political activism. In fact, as early as the 1870s the Métis had a governing council at St. Laurent (near Batoche), with Gabriel Dumont serving as its president. After the 1885 Resistance, most Métis disengaged from public life; however, in the 1940s they began to organize collectively through various political lobbies—the predecessors of the modern MN–S. Today, the MN–S is a parallel government that represents the political, social justice, cultural and economic interests of the province’s Metis. Since the 1990s, the MN–S and its affiliates have worked towards self-government for the province’s Métis community. This is primarily done through strategic partnerships with government, such as the tripartite process with the federal and provincial governments, and through the Métis Act, which strengthens the bilateral process between the province and the MN–S. At present, the MN–S is seeking to establish a Métis land base, with full resource extraction rights, in the province’s northwest corner in order to implement full Métis hunting rights across the province (these currently exist only in the north) and to ensure the proper stewardship of Métis heritage—as in the agreement with Parks Canada to manage Batoche National Historic Park. In mainstream politics, the province’s Métis generally support the New Democratic or Liberal parties; as part of the larger Indigenous vote, they will play an increasingly large role in Saskatchewan’s political life in the decades ahead. Future challenges for the province’s Métis include reforming the criminal justice system, preserving their languages and culture, maintaining and increasing access to education and employment, improving their standard of living, building self-governing communities, and establishing effective political leadership. Barkwell, L.J., L. Dorion and D.R. Préfontaine (eds.). 2001. Métis Legacy. Winnipeg and Saskatoon: Louis Riel Institute and the Gabriel Dumont Institute; Dorion, L., T. Paquin and D.R. Préfontaine. 2000. The Métis: Our People, Our Story. Edmonton and Saskatoon: Arnold Multimedia and Gabriel Dumont Institute. Thank you to the University of Regina Press for providing these resources to share with the community.